Vinyl fencing is a wonderful option for any homeowner. It acts as a beautiful complement to any landscape. 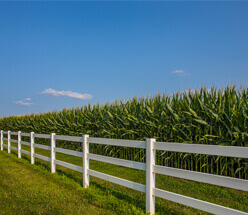 Our Central Illinois customers love vinyl fencing especially for its hassle-free nature: It does not require painting. It is easy to clean and is virtually maintenance-free. With this type of fencing, you would never need to worry about termites or rust, as you might with wood or metal fencing. And vinyl will not warp as it is nearly five times as strong as wood. It is truly a smart choice when it comes to fencing for aesthetics, variety, and durability. At Hohulin Fence, we have served over 115 in the fencing industry. 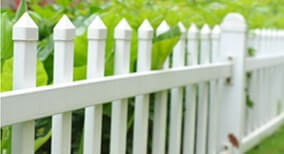 Because of our longevity in the fencing business, we know when we see quality fencing products. 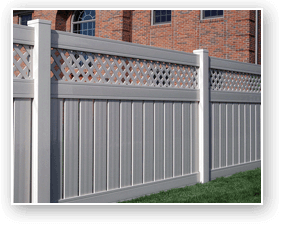 In vinyl fencing, the names we have come to trust are Kroy and Polyvinyl. These are trademark names in the vinyl fencing industry. Both manufactures offer maintenance free fencing with lifetime transferable warranties. So whether you are looking for picket, semi privacy, privacy, or horse rail vinyl fencing, both manufactures carry a wide variety of style and color products, all of which are manufactured in the United States. Click here for Kroy styles and colors. Click here for Digger Specialties (Polyvinyl) styles and colors. Get Your Vinyl Fencing Today! Choose Hohulin Fence for all of your vinyl fencing needs! If you are considering purchasing fencing for your home, talk with our team of fully trained fencing professionals today. Contact us online or call us at 309-316-1008. For other residential fencing options, see our following pages: Chain Link Fencing, Wood Fencing, Ornamental Fencing, Simtek Fencing, and Hot-wired Fencing.